It happened. I “popped” as they say. I officially look pregnant without a doubt. Even a month ago, some people didn’t realize I was pregnant just by looking at me. (Usually I was wearing a loose shirt or an open jacket) but now there is no mistaking it. Just look at the change in my bump shots over the last 3 weeks! Thankfully I am still sleeping well. I can’t imagine how cranky I’d be if I weren’t, because I am tired all the time now. I don’t have much patience when I’m tired but Andino knows that so he doesn’t push my buttons. (smart man!) Until now I’ve maintained my regular workout schedule and household chores that I did before I got pregnant, but I told Andino on the weekend that I might have to start scaling it back a notch. I felt kind of guilty saying so because he is a much busier person than I am but he totally understood. He asked me which chores I’d like him to take on and I told him it would be nice if he could be in charge of cleaning the bathroom. I find it hard to bend over the toilet and tub and stretch to clean the walls inside the shower. This weekend I realized the work of growing a baby is finally starting to catch up with me. As tired as I’ve been lately, I’ve been worried about the possibility of having gestational diabetes and how that would impact my life during the next two months. I was looking forward to seeing my midwife this Thursday to discuss the results of my second glucose test, but she called on Friday afternoon. She said the same thing she said when she called to tell me I failed the glucose screening test: “Do you have time to talk right now?” I wasn’t expecting to hear from her because I assumed that like a Doctor, she’d only call if something was up and I didn’t expect to fail the glucose tolerance test. “I’m just calling to let you know that everything was fine with the second glucose test” Yay! I was so relieved. I appreciated that she called to let me know, so I wouldn’t have to wonder until my next appointment. In other news, I have been having fun learning how to use my new camera. I’ve been looking for photography tips on Pinterest and I’ve started taking a few shots. I am so excited to learn more and hopefully take some great shots this summer. You guys. How is it possible that I am going to be in the third trimester in a few days? Wasn’t it just a few weeks ago that I was so overwhelmed I hung up on the nurse who said the words I’ll never forget? Things have been going so smoothly. After 2 years of spending every last bit of my emotional reserves on keeping it all together, I’ve delighted in the ordinary of the past 6 months. I took relaxing baths, read novels, tried new recipes, attempted to take up crochet (but it’s been 6 months and I’ve still not finished the baby blanket I started so I realized that crochet is not my thing.) I didn’t spend hours researching. Not only did I not research IVF or adoption programs, I also didn’t research baby stuff. Other than my weekly email update from Baby Centre & Lucie’s List and the occasional Pinterest article, I haven’t researched baby advice at all. But now, the relaxation of the first two trimesters is starting to wear off and this is getting real. Baby girl’s kicks are getting stronger and they are a constant reminder that she is coming soon. Her nursery is well underway and she has a name (unless we change it again!). I’ve started thinking of my pregnancy in terms of how many weeks are left rather than how many have passed. I suggested to my Manager that we hire my replacement soon (which was totally bittersweet because I love my job and it’s going to feel so weird handing over the reigns to my program for a year.) 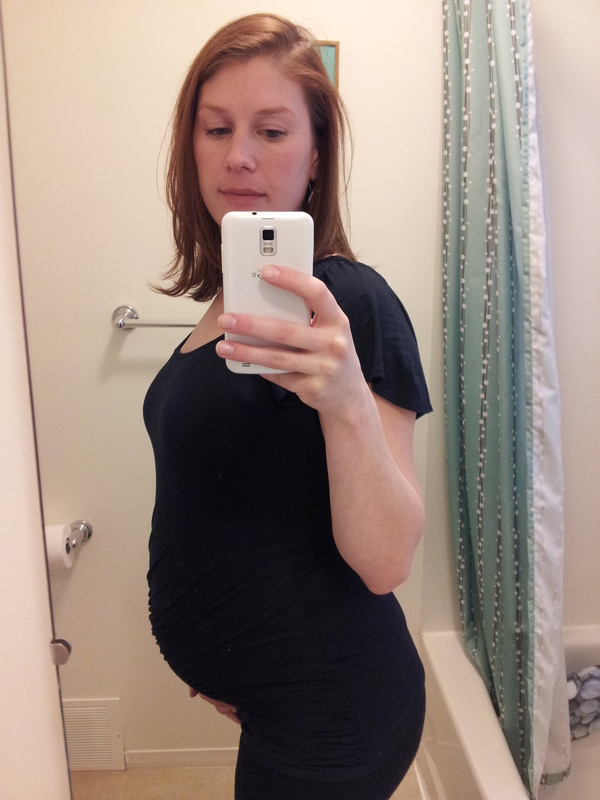 With the arrival of the third trimester, I’ve started to focus on preparing and taking charge of my prenatal care. I had my second appointment with my midwife on Tuesday and I was already asked to make some decisions for baby. She explained that newborns are routinely given an injection of Vitamin K after delivery to encourage blood clotting. She said it’s important because Vitamin K does not pass to the baby through breast milk and asked for my consent. I was fine with this injection and readily gave my consent. She also asked for my consent to apply antibiotic eye ointment to prevent an eye infection that could be passed to baby if I had gonorrhea or chlamydia. To be honest, I really don’t like the idea of the eye ointment and although I initially gave my consent I want to discuss it with her again during my next visit. After leaving, I did a little research and discovered that automatic erythromycin prophylaxis is no longer used in the United Kingdom, Australia, Norway, or Sweden and it made me second guess my consent. I don’t like the idea of administering antibiotics to the baby 1 hour after birth especially considering Andino and I have been tested for STDs more times than I can remember over the last couple years because it was required for IVF. I chose a midwife because I wanted to feel empowered to take an active role in the decision making. Although I feel a little uncomfortable questioning her recommendation for the eye antibiotics, I am going to do it because it’s what I think is best. After discussing the newborn medications, she asked if we have a car seat to bring baby home from the hospital in ( we don’t, but we still have so much time to get one, don’t we?) and we briefly discussed how the delivery will be. She says she will come to our home and be with us until I reach 5-6 cm at which point we will go to the hospital to deliver. She discussed taking baths and nitrous oxide (laughing gas) as pain relief options. She didn’t even mention an epidural which was fine with me since I don’t plan to have one. Recently, I ordered Ina May’s Guide to Childbirth from Amazon and I am really excited for it to arrive. As I said, now that I’m in the third trimester I’m ready to research and get prepared! Oh and p.s. I updated my bump page again. I’m (finally) at the stage where it’s completely obvious I’m pregnant which is quite exciting. We had our first appointment with the midwife on Monday and it was great. On the way to the hospital Andino asked me if I had any intuition as to which midwife we would be assigned. I told him I felt like it would be the Nigerian lady (who I will call Chinue here, which is very similar to her name but not her actual name) because I felt a connection to her during the orientation we had at the hospital last week. Of course my gypsy intuition was right and I gave Andino a big smile when we entered the midwife office and saw Chinue was waiting for us. The meeting was an hour long and Chinue was thorough without being rushed. She started by asking questions not only related to my medical background but also to understand my emotional health. That was new for me although I wasn’t surprised because I went into this assuming that midwives provide more holistic care. She had me fill out a questionnaire to assess my state of mind so she could have a baseline to refer to when keeping an eye out for post-partum depression. She asked me what my support system is like and if I feel happy. She also asked about my nutrition, how much water I’m drinking (apparently not enough) and went through the warning signs or pre-term labour, high blood pressure and what is typical in pregnancy. She said for example, mild headaches and mild back pain is fine but if I experience severe discomfort I should call her. I loved that she made me feel like I could call any time to ask questions. One thing I noticed about Chinue’s approach, was that every test we discussed was presented as an option. She explained the reasons and benefits to everything from the glucose tolerance test to manual exams and then asked me if I wanted to proceed or not. I never felt bullied by my Doctor into anything, but I just noticed a difference in the way Chinue presented things and I prefer her approach. I felt like I was really playing an active role in my care. Our next appointment is in a month. It seems like time has been flying by for me since I’ve been pregnant. I’m already 23 weeks! I am flying home to Nova Scotia on Monday to spend a couple weeks with my family. (Chinue said there’s no harm in flying at this stage.) By the time I get back I’ll be 26 weeks, I wonder how much my bump will grow by then. I definitely had a growth spurt after 20 weeks. Once I get back, I only have 12 weeks of work left. It’s weird to be counting down the time like this. It feels like just yesterday I was telling Andino the news that I was finally pregnant, and now I’m more than halfway done!